Even a few of the victims themselves, or their kindred, have been buying the cards. New York Sen. James Buckley, who’s depicted as a bland, righteous Puritan (four of clubs), reportedly bought 12 decks for Christmas gifts. And, Mamie Eisenhower’s nephew allegedly bought 24 decks for the ladies of Mamie’s bridge club to giggle over- despite the fact that grandson David Eisenhower comes off as a drooling adolescent naval officer (two of spades) who’s married to a fearsomely austere Salvation Army collector, Julie Nixon Eisenhower (three of spades). 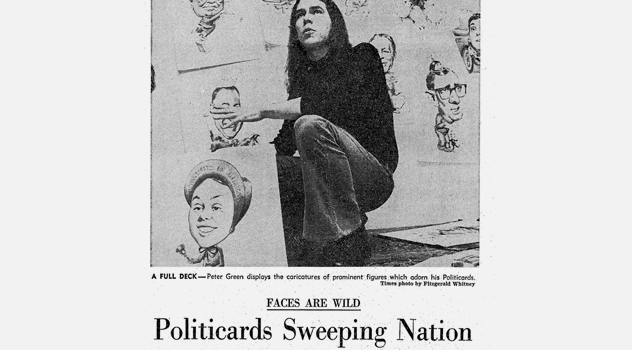 The quick-witted mind behind America’s latest snicker at itself is a fast-rising young talent of the caricature world named Peter Green, 26. 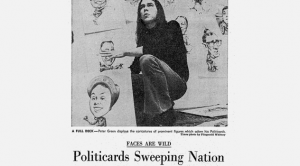 And he doesn’t think any of his caricatures are unduly harsh on their victims- not even Sen. Edward Brooke (four of clubs), whose portrayal as a watermelon-eating Uncle Tom has caused some leading department stores to refuse the cards. If anything, Green thinks some of his cards may be too mild. Chicago Mayor Richard Daley (10 of diamonds) stands innocently holding his suitcases, ready to take off on some new venture. “I’ve had a lot of criticism on both of those cards for not coming down a lot harder,” said Green. He’s also been criticized, he says, for including only six women in his deckthe three Nixons, Mrs. Mitchell, Lady Bird Johnson and Jane Fonda. In selecting personalities for the deck, Green sought figures who were not only politically prominent, but whose facial features or personality traits lent themselves readily to the art of caricature. “Some people have faces that are just blahlike Gerald Ford (House minority leader). And Tricia Nixon. So I had to play with their personalities instead. Likewise, Green depicts consumer crusader Ralph Nader as a member of the Nader’s Raiders gang, stealing a hubcap. “Maybe he’s fulfilling some early urge to belong to a teen gang, but is turning it into a positive goal, not a negative one,” shrugged Green with an easy-going chuckle. 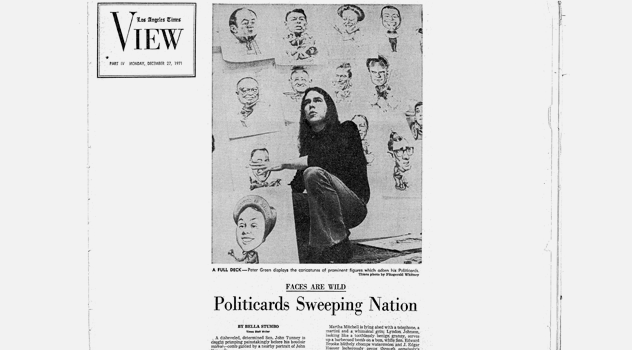 As much as anybody, Green is fascinated by the public’s perpetual enthusiasm for the ancient art of caricature. But he thinks the explanation is probably simple. “In caricature, you usually put a big head on a tiny body. And you focus on certain irregular, striking features of the subject’s face. The result is that he looks funny.